Clinical presentation A middle-aged man was admitted for episodes of fresh per-rectal bleeding, which were not associated with defecation. He was recently investigated for macrocytic anaemia in the outpatient haematology clinic. Examination of the perineum revealed grade 1 internal haemorrhoids with no signs of bleeding. Initial laboratory tests revealed macrocytic anaemia (haemoglobin 10.5 g/dL, normal 12.9–17.0 g/dL; mean corpuscular haemoglobin 95.3 fL, normal 80.0–95.0 fL). Peripheral blood film showing blasts, dysplastic neutrophils, nucleated red blood cells and hypogranular platelets. The patient underwent a sigmoidoscopy and rubber band ligation of the internal haemorrhoids after persistent fresh per-rectal bleeding. The bleeding persisted with the development of hypotension and a significant drop of haemoglobin to 4.8 g/dL requiring blood transfusions and intensive care monitoring. Repeated endoscopy, including intubation of the terminal ileum, revealed uncomplicated right-sided diverticulosis. CT mesenteric angiography performed during an episode of significant bleeding revealed extravasation of contrast in the ileum, but mesenteric angiography was unsuccessful, possibly due to a temporary cessation of bleeding. 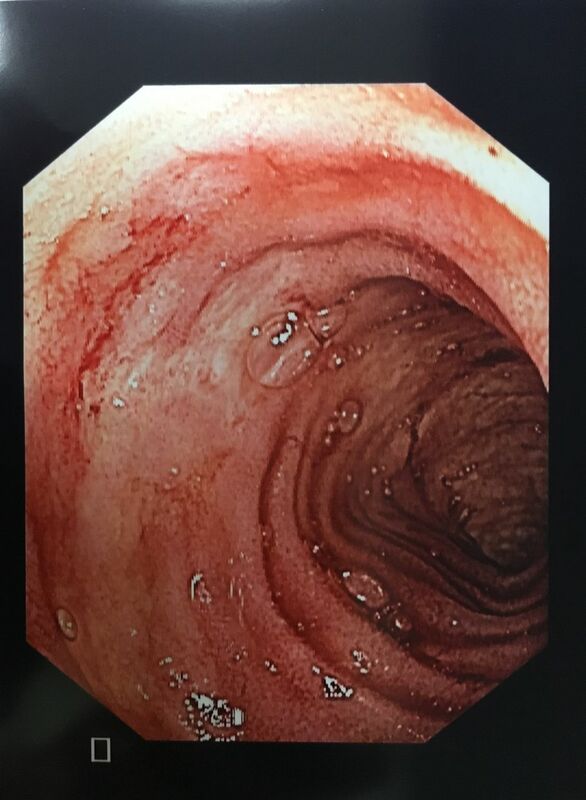 Bleeding subsequently recurred and in light of the persistent bleeding with no clear source and with a total of 12 units of packed cell transfused, exploratory laparotomy, on-table enteroscopy (figure 1) with small bowel resection was performed. Histopathological examination of the specimen was performed (figures 2⇓–4). Multiple ileal lesions with stigmata of recent bleed. Area of ulceration associated with atypical mononuclear infiltrate. Atypical mononuclear infiltrate composed of cells with enlarged, irregular nuclei containing variably prominent nucleoli. 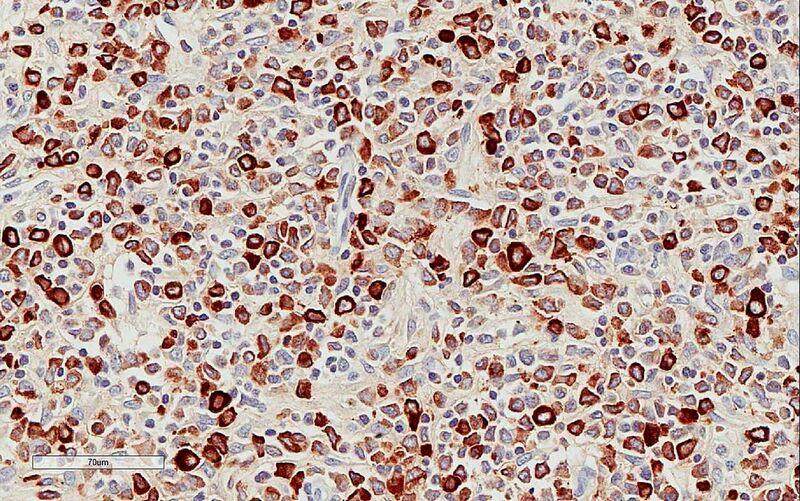 Atypical cells displayed cytoplasmic expression of myeloperoxidase. Question What is the diagnosis? Intraoperative enteroscopy revealed multiple benign-looking ileal lesions with stigmata of recent haemorrhage. 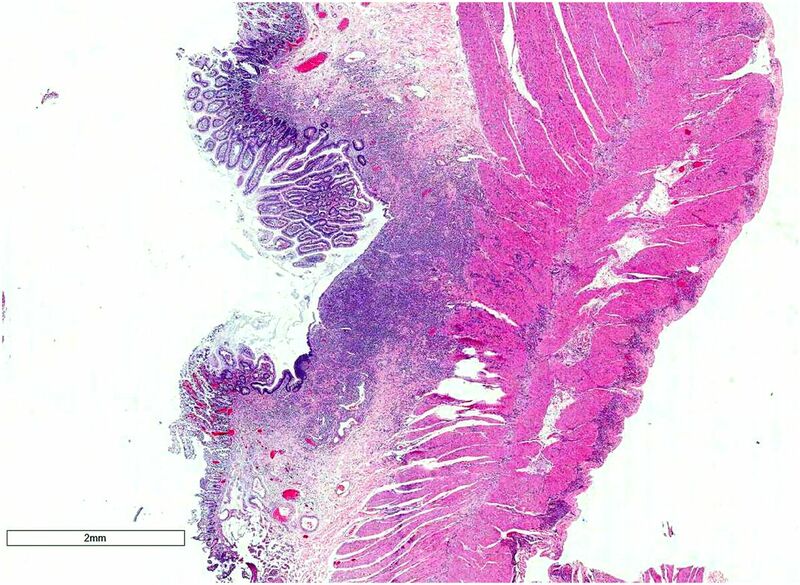 The resected ileal specimen showed areas of ulceration associated with atypical mononuclear infiltrate composed of cells with enlarged, irregular nuclei containing variably prominent nucleoli. The majority of atypical cells displayed cytoplasmic expression of myeloperoxidase, which can give the lesions a greenish hue.1 The patient recovered well from surgery with no further rectal bleeding. He was later confirmed to have chronic myelomonocytic leukaemia, which progressed to acute myeloid leukaemia (AML) and was started on chemotherapy and was scheduled for surveillance endoscopy. 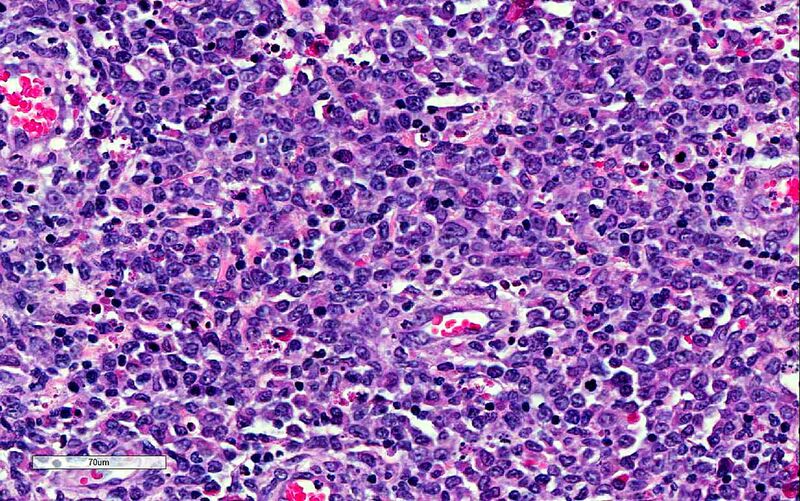 MS is a rare extramedullary tumour of immature myeloid cells commonly associated with AML and other myeloproliferative syndromes. It can present as the initial presentation of AML or a relapse of the condition. MS has a reported incidence of 2%–7% in patients with AML. MS can develop in many locations. Treatment of the underlying haematological pathology has been reported to improve MS.
GI MS is commonly located in the ileum. Clinical symptoms include those related to bowel obstruction, fever or perforation. There have only been three reports where MS presented with multiple lesions, two of which were in adults.2 ,3 To our knowledge, this is the first reported MS presenting with multiple lesions causing frank per-rectal bleeding. GI MS may not be easily appreciated radiologically or on endoscopy, as in this case, resulting in a diagnostic challenge, emphasising the need for histological confirmation.
. A case of chloroma. Monthly J Med 1853;17:97.
. Granulocytic sarcoma of the small intestine. Arch Pathol Lab Med 2006;130:1570–4. Contributors FHK: study concept and design, acquisition of data, drafting manuscript and critical revision. FP: acquisition of data and critical revision. CSC: study concept and design and critical revision. Ethics approval Approved by the National Healthcare Group Institutional Review Board.